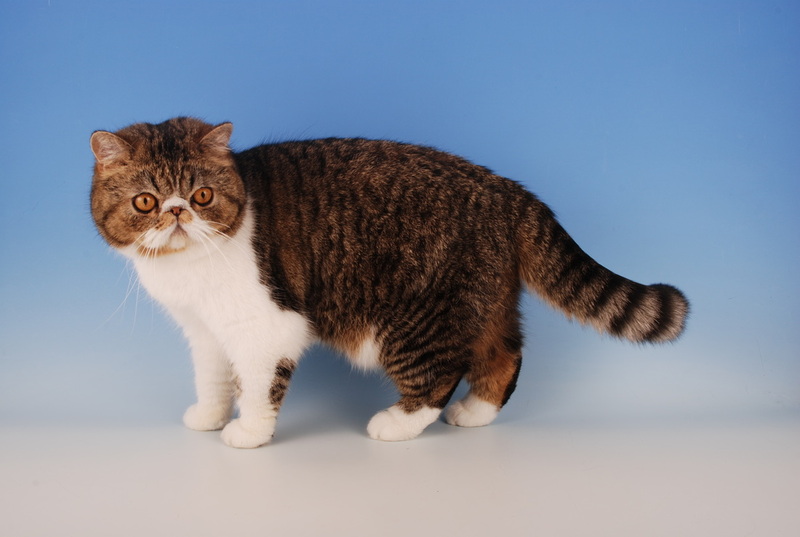 An Exotic is a large, cobby cat of Persian type with a dense, plush coat of medium length that is full of life and stands out from the body due to its density. The coat is slightly longer than other short-haired breeds but not long enough to flow. The head is round and massive with good breadth to the skull and well-balanced with large, full, round eyes with a bold expression. Exotics come in the same coat patterns and colours as the long-haired Persians. Exotics should be handled gently but firmly and allowed to stand on the judge’s trolley rather than held in the arms. The coat should never be smoothed down. To assess pattern, it is often useful to stand back from the cat.